Rolls-Royce Ghost Performance, Engine, Ride, Handling | What Car? While other luxury cars are available with various engine options including hybrids and diesels, the Ghost has but one: a whacking great 6.6-litre twin-turbocharged V12 petrol with 563bhp (or 603bhp for the Black Badge model). Setting aside concerns about the environment or fuel consumption for just a moment, it’s delightful. Even starting it is a pleasure, because it whirs over smoothly on the starter, before firing and settling into a perfectly steady idle. Select drive, using the steering column-mounted gear selector, and in general driving it has what Rolls-Royce used to describe coyly as ‘adequate’ power, meaning a solid wall of oomph to ease the car along without it feeling in the least bit strained. Don’t extrapolate from that a lack of out-and-out pace, though. Bury your foot deep into the lush pile of lambswool rug and that splendid lady perched on the grille tilts skywards as the bonnet rises with the force of acceleration. Or, more simply put: the Ghost takes off at a hell of a lick – 0-62mph takes just 4.9sec. Only when you try to achieve that rampant acceleration and stretch the V12 past 4000rpm do you notice its muted growl. The rest of the time, including when you are sitting at a steady 70mph cruise on the motorway, it’s notable only by its absence of noise. The eight-speed automatic gearbox blurs the transition between one gear and the next, and will even use GPS to select the appropriate gear for approaching bends. Other than an occasional thud if it's caught out when your foot is on and off the accelerator in stop-start traffic, it’s exemplary. It’s a shame that the ride isn’t better. For example, drive along a lightly rippled road, or one with wavy undulations, and the way the Ghost floats along is both comforting and comfortable. Yet, throw in a sharp-edged ridge or a deep pothole and it clobbers over it in an unruly fashion. This probably has much to do with the standard run-flat tyres but, either way, a Mercedes-Benz S-Class on the smaller wheel options, or even a BMW 7 Series, is less jarring. 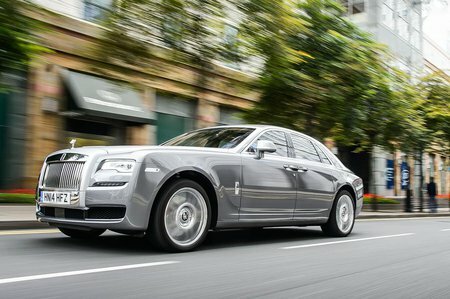 Around corners, the Ghost feels every bit its two-and-a-half tonnes. Comparatively, an S-Class or 7 Series feels nimbler and sharper through turns, while the Ghost is more ponderous and leans acutely if you attempt to press on. The light steering is at least direct and accurate; be measured with your corner-entry speeds and it’s an easy car to place. The steering does suffer from a lot of kickback and vibration over rough surfaces – something you might wish for in a sports car but not in a limousine. 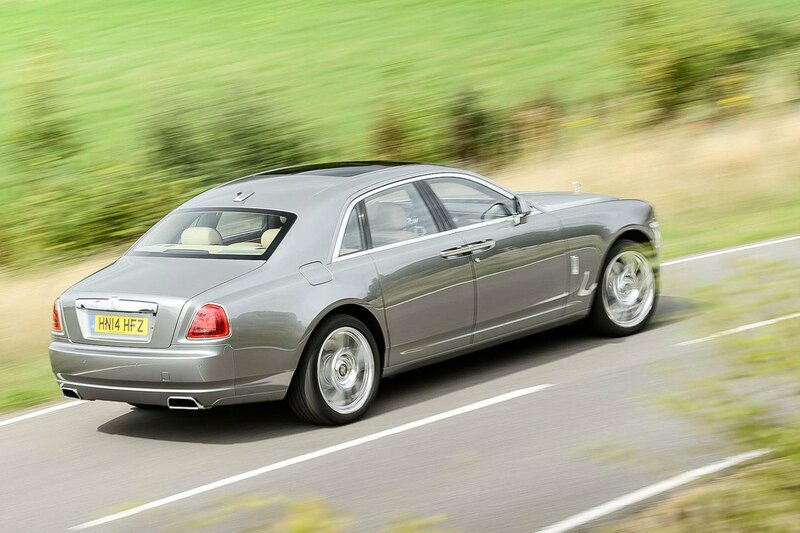 Yet, despite appearing to have the aerodynamics of a small bungalow, the Ghost does an excellent job of isolating you from wind noise on the motorway, along with tyre noise.